Dr. A.K. Singh is a popular Ophthalmologist in Jacobpura, Gurgaon. He has over 40 years of experience as a Ophthalmologist. He is a MBBS, MS - Ophthalmology . He is currently associated with Rajiv Memorial Eye Infirmary in Jacobpura, Gurgaon. You can book an instant appointment online with Dr. A.K. Singh on Lybrate.com. Lybrate.com has a nexus of the most experienced Ophthalmologists in India. You will find Ophthalmologists with more than 25 years of experience on Lybrate.com. 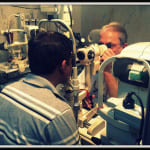 Find the best Ophthalmologists online in Gurgaon. View the profile of medical specialists and their reviews from other patients to make an informed decision. He is very energetic and positive. He pay attention to the patient. She is suffering with eye problem, and some time she is with highly headache on only middle side. She doesn't see all thing clear without glass. She doesn't wear glass always. please give in me information about control on it. I am 25 year old I am suffering sleep deprivation I am sleep only 3 or 4 hr on 24 hr some time I am not sleep over 24 hr please take advice for this reason I feel weakness and my study are very affected and within 7 days under eye dark circles increase please help me. Hi, I'm 32 years old female and have puffy eyes from age of 21. The puffiness is worsen in last 2 years & left eye shows more swelling than right one. The puffiness increase before menstruation cycle. There is no other problem with eyes. It is due to pre menstrual syndrome. In some people, it happens. No need to worry. It is due to progesterone and estrogen hormone. Drink plenty of water which can decrease the fluid retention. Although you need more consultation if it bothers you. You can consult with me in private consultation. I am 20 years, I have been suffering from burning sensation in the eye. Even if I close my eyes it pains. I read a lot and work on computer at times. Eye strain, or asthenopia, is when the eyes get tired from excessive or intense use. It can be annoying, but it tends to disappear with rest. Although it’s not often a serious condition, eye strain could be a symptom of an underlying problem. Eye strain is known to cause fatigue, difficulty concentrating, and headaches Eye strain may lead to other problems, such as: •	Headaches •	Difficulty Concentrating •	Irritability •	Burning Sensation •	Watery Eyes •	Dry Eyes •	Photophobia •	Eye Pain HomeTreatment for Eye Strain 1. The first thing you can do is change your environment and work habits. By doing this you can relieve the pain without spending money on treatment. If you work on the computer, try taking more eye breaks by looking down the hall or out the window, or by closing your eyes for thirty seconds. You should get your eyes checked at least once a year, especially as you grow older. Routine eye exams give you the opportunity to discuss with your Eye Specialist any issues you may be having, and they may enable you to catch any problems in their early stages. Age	Frequency 0 to 6 months	Minimum of once a year 6 months to 18 years	Every 2 – 4 years 19 to 39 years	Every 3 – 5 years 40 to 64 years	Every 2 – 4 years 65 and older	Every 1 – 2 years If you spend a lot of time sitting in front of a computer or reading, you may need prescription glasses solely for those activities. Prevention of Eyes From Straining If you work on a computer, taking eye breaks for five minutes every hour can lessen the strain on your eyes. Simply closing your eyes for a few moments can also do wonders. Try standing up, moving around, or taking a short walk to help regain concentration.Regular eye exercises that involve focusing on different distances can help prevent future straining. Blink often. Blinking refreshes and replenishes your eyes naturally.If you are having trouble with blinking due to the dryness of your eyes, try using Homoeopathic CINELUBE EYEDROPS ( HAPDCO) 3 times daily. I have some problem with my eye that is I have power of -2.0 and eye get wet when I do some thing on mobile what should I have to do? Get your refraction done and wear spectacles Eat green veggies. Carrots. Strain less your eyes. Relax your eyes in between work. Blink regularily if working for long time on computer. Lower the brightness of your screen. Work under adequately illuminated conditions. If needed wear corrective spectacles. These r few things you can take care of. Otherwise as such no options available which wd increases your eyesight. When I wake up in the morning I notice few a times that left corner of my left eye filled with fluids. For a little time it exist and then it disappeared, I feel uneasy to open I lead and little pain. What is the reason? Dear L U:- U r suffering from Acute conjuntivitis. Following treatment is being recommended to you E/d MFC 4 times a day ×7 days E/o MFC AT night × 7 days. Myopia - How To Know If Your Child Is Suffering From It? Long sightedness is also triggered by underlying conditions such as diabetes, under development of a baby&#x2019;s eye during pregnancy, orbital tumours and problems with the blood vessels in the retina. Double vision can make one eye more dominant than the other. This makes the muscles of one eye degenerate at higher rate than the other making it lazy. This is known as amblyopia. In case you have a concern or query you can always consult an expert & get answers to your questions! I don't have number specs but I use laptop alot Atleast 7 hr a day because of my job. What should I do to prevent my eyes from laptop rays. The solution for this problem is its controlled usage and while using computor use in proper light. There is nothing more effective than controlling usage to reduce and negate the effects. You can also reduce the intensity of the computor screen by attaching a filter or by getting an eye-friendly screen. Above all, one must try to control the amount of computor usage or take frequent breaks. Homoeopathic medicine CINELUBE EYE DROPS ( HAPDCO) Pour 2 drops 3 times daily. I am 18 years old and I have 4.5 power spectacle in my eyes. Am I eligible for IAF? My eye itches a lot and this has recently started. Is there any cure to this? Can you please prescribe any liquid dropper or medicine which can stop this excess of itching in the eye and watering also. Itching of eyes can be due to many reasons so prescribing treatment without seeing is not possible in the mean time you can take protective measures like wear sunglasses when you go out don't work on computer too long in one sitting don't rub your eyes drink plenty of water if required then you can splash drinking cold water in your eyes you can use some lubricanting drops too.